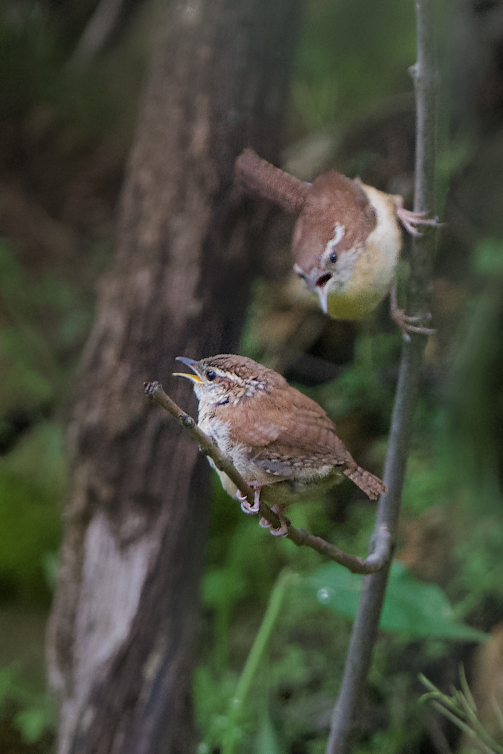 Yesterday as I was searching for the little baby owlet in Valley Forge I was walking down the path carrying my camera and tripod when a Mamma Carolina Wren came flying my way with three brand newly fledged babies. One of the babies was a little confused and landed on my tripod leg as I was holding it. I gently put the tripod down and the baby jumped on my leg. She looked up at me and could tell I was not her mamma. I looked down and said hello and she looked surprised and then flew off. I followed the little family and was able to get a not so good shot of the Mamma telling the baby not to do that again. Oh how I love this time of year.